Simply Living: Will cell survive dip in loo? Will cell survive dip in loo? If you have a cell phone and who doesn't these days? -- you've probably come to depend upon it. I know I have. My personal dependency was recently tested when our 3-year-old Motorola flip phone had an unfortunate encounter with the working end of a toilet. Suffice it to say that technological wonders of communication and mechanical objects of waste removal are not meant to converge. 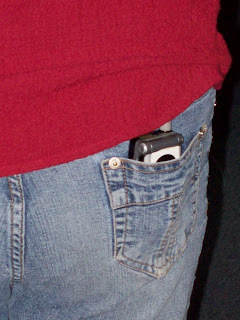 It might also be worth mentioning that the back pocket of tight jeans is not the most secure spot to stuff a phone when said jeans are about to be lowered in front of a porcelain bowl of water. In case you're not aware, close encounters of a wet kind render cell phones inoperative. In less time than it takes to say, "Can you hear me now?" a submerged phone will become eerily mute. No dial tone. No time display. No sign of life at all. For one brief panicky moment, I stared at my de-pocketed communication device, chastising myself for my foolish behavior. Then I pushed aside all thoughts of regret or propriety and stuck my hand down the hopper. I fished out the phone, took it apart and proceeded to dry out its individual parts. Inside a cell phone are two major components: the battery and the Sim card. Think of the tiny Sim card -- smaller than a postage stamp -- as the cell phone's brain. In it is stored all the information you've ever entered -- phone numbers, call logs, voice messages, etc. If the Sim card is the phone's brain, the battery is its heart and, like a human heart, it pumps less efficiently over time. Eventually, it shuts down completely and the cell phone dies. My phone's battery had been showing signs of age for months. It wouldn't hold a charge, and calls often cut off before I had a chance to answer them. Because of these problems, Ralph and I had been considering alternatives. A few days before the commode experience, I had asked a sales representative how much it would cost to replace the phone's battery. What I learned was: A) new batteries for old phones are not readily available, and B) if you are lucky enough to find one, it will cost more than three times the price of the least expensive new cell phone. Because of the economic implications, we resigned ourselves to the inevitability of getting a new phone. And although there is an element of excitement in the idea of buying a fancy new gadget with cool features and sleek, smooth looks, there is also trepidation. Past experience has proved that no matter how "easy to use" technological wonders claim to be, a steep learning curve -- one that is occasionally insurmountable -- will be involved. Unfortunately, that's exactly what happened. Thanks to our diligent drying efforts, the Motorola was resurrected, but we remained apprehensive about its long-term survival. Since we knew we would eventually have to buy a new phone, we decided to follow our phone's lead and take the plunge. After being promised by the youthful employee at the local T-Mobile store that the Samsung Beat was the "best choice" among all the "free" phones (add on the $18 upgrade fee), we signed the papers and headed home, new gadget in hand. It was only after we got back and began to fiddle with it that we realized what a mistake we had made. The Samsung Beat is a pretty phone. Compact and attractive, it has a built-in music player and camera and can even take movies. What it also has is a speakerphone that is barely audible and an external time display that goes blank after three seconds. I spent just under four hours reading the manual, pressing buttons and fiddling with settings only to discover I couldn't care less about its built-in music player, camera and camcorder. What I really want is a loud speakerphone and an external time display that stays constantly lighted. So I'm taking it back. I'll probably have to deal with a different youthful salesperson who will try to convince me that another sleek and fancy phone would be "a much better choice." But I doubt if it will. Right now, I'm leaning toward buying that expensive battery and staying with my old phone for as long as possible. It's hard to match what you're used to. My Motorola -- ancient though it is in techno terms -- does what I want it to do, and I've come to realize how dependent I am on familiar patterns. A cat may have nine lives but as of now, my cell phone has two. If a dip in the loo couldn't kill it, who am I to bury it in a drawer?